Follow the instructions provided in the following Document. The DLI 9000 is available with an optional 2D barcode scanner attached. To use this scanner with the new Remote POS Device manager you will only need to enable a couple of settings. 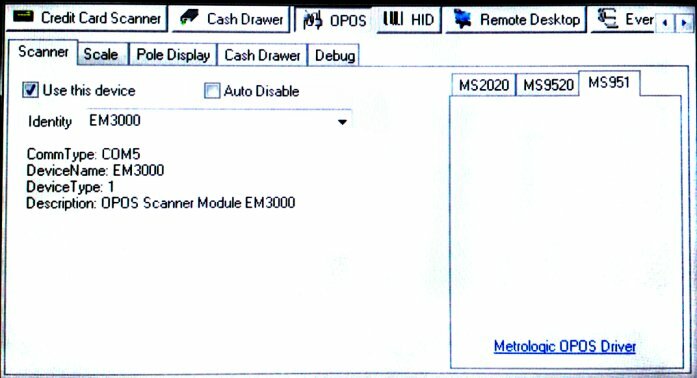 In the new POS Device Manager, go to the OPOS button, and click on the Scanner tab. Now put a check mark in the Use This Device checkbox, and in the Identity drop down, select the EM3000. If you have already configured the POS Device Manager for remote desktop access, you can now test it in System Five and it should be able to scan barcodes directly into System Five. If not… Check the POS Devices in the setup wizard and make sure the barcode scanning settings are set up correctly. Driver's license scanning should also work now for Canada only. US Drivers License scanning is not yet supported for this device.